Sunday and yesterday were great. Getting to know Frieda Anderson and meet the other ladies who came to the annual Fall Quilting Adventures has been a blast. Sunday we had a gathering to get acquainted and show what we have been working on and/or have finished from the last workshop. Then we had a "get to know" session with Frieda and saw a lot of her quilts and hand dyed fabrics, beautiful colors! Yesterday we had our first full day of creating a tree quilt. This picture above is how mine turned out. I love the vibrant colors. 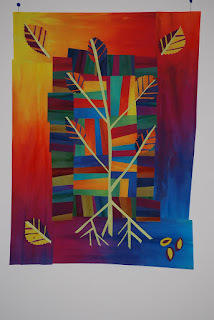 It is all hand dyed cotton except for the tree trunk, stems and roots ~ that is hand dyed silk. All of the hand dyed fabric I used today was from Frieda's stash (kit) that she handed out for us to use. We all opted to skip our break yesterday afternoon and continue working. Here are some pictures of our group. We had homework for today. We had to create a few sketchs to create our own tree quilt today. We'll also be using our own fabrics...and what we want to buy from Frieda! I attended a workshop with Frieda's buddy, Laura Wasilowski, in Chicago a few yrs ago - LOVE their fabrics and flosses. I bet you're now a graduate of the Chicago school of fusing, as I am. Happy Fusing!! !